Birth of Harold Jeavons registered September quarter 1895 in Dudley. 2 Parkes Hall Road, Woodsetton, Staffordshire. Isaac Jeavons (43, Colliery Labourer – below ground, born Sedgley), his wife Jane (42, born Sedgley), and their 8 children: James (17, Colliery Labourer, born Sedgley), Benjamin (15, Colliery Labourer, born Sedgley), Daisy (13, born Sedgley), Margaret (11, born Sedgley), Jane (8, born Sedgley), Harold (5, born Sedgley), Frank (2, born Sedgley), and Charles (1, born Sedgley). Jane Jeavons (53, Widow, born Dudley), and 6 of her 11 surviving children of 12: Margaret (21, Japanner, born Woodsetton), James (27, Colliery Labourer – above ground, born Woodsetton), Harold (15, Colliery Labourer – above ground, born Woodsetton), Florence (12, School, born Woodsetton), and Charles Alfred (11, School, born Woodsetton). Also Jane’s married daughter Daisy May Aldridge (23, born Woodsetton), Daisy’s husband Samuel Aldridge ( 34, Carter, born Gornal), and their daughter Margaret May Ann Aldridge (11 months, born Woodsetton). Harold Jeavon’s Soldier’s Papers are the only set to survive for a Woodsetton man. Harold attested in Tipton on 10th December 1915 under the Derby Scheme, this meant that he would immediately be allocated to the Reserves and not be subject to conscription which was about to commence. In return Harold agreed to be called-up according to a group rota system according to age, marital status and occupation. It was 18th April 1917 before he was mobilised, by which time he had married Annie Shaw at Sedgley Church on 27th January 1917; their son Harold was to be born on 18th November 1917. Prior to his mobilisation he was subject to a medical examination on 16th February 1917. He was 21 years of age, employed as a miner, and stated his religion as Wesleyan. His physical development was described as good and his eyesight was perfect; he was 5 feet 6 inches tall with a 36-inch chest, and weighed 141 pounds. He was passed as Category ‘A’ – “Fit for General Service”. On his mobilisation Joseph was allocated to the Royal Scots Regiment, initially to the Depot battalion but a few days later, on 26th April 1917, to the 3rd battalion for training in Glencorse, in the Pentland Hills about 8 miles south of Edinburgh. After just a month Harold was appointed unpaid Lance-Corporal, and then on 17th July 1917 had this rank made official. He was to be made full Corporal a year later on 15th August 1918. As his training was coming to a conclusion, Harold was granted pre-embarkation leave from 5th to 13th December 1917. This allowed him to see, probably for the only time, his newly born son Harold. Harold embarked from Folkestone to Boulogne on 3rd January 1918, and was posted to the 16th Battalion, Royal Scots, on the 16th January 1918. He twice required medical treatment for scabies, in January and February 1918, before joining the 12th Battalion, Royal Scots on 24th May 1918 when he was posted to ‘D’ Company. He was serving with the 12th battalion when he was killed in October 1918. The Hindenburg Line had been breached on 29th September 1918; this signalled that the war was rapidly drawing to a conclusion. In the 6 weeks until the Armistice, a succession of battles forced the Germans back in an east or north-east direction. The Battle of Courtrai began on the 14th October 1918 with the allied forces pushing the Germans back in a north-easterly direction along an 18-mile front between Comines to Dixsmude. The 12th Royal Scots, as part of 9th (Scottish) Division, were in the south of the line, and in the days from 14th to 19th October advanced 10 miles taking the towns of Menin, Courtrai and Harlebeek. On the 20th October the battalion took a brief respite before beginning preparations for a renewed advance. We know from his Soldier’s Papers that Harold Jeavons was in ‘D’ Company so, although not proven, it is likely that Harold and his comrades Sgt. Missing and Pte. Hollingsworth, were killed by shell fire. Harold is recorded as being initially buried “4½ miles East of Courtrai”, this corresponds with the position given in the 12th Royal Scots War Diary. As part of the post-war ‘concentration’ of battlefield burials into formal Imperial War Graves Commission cemeteries (later Commonwealth War Graves Commission), Harold’s remains were exhumed from map reference 29.I.29.a.1.9. this is just over a mile due west of Vichte, today a residential street named Klijstraat. Also found were his 12th Royal Scots comrades, Sgt. Missing and Pte. Hollingsworth. He was re-interred into Harlebeke New British Cemetery on 1st June 1920 with his two comrades re-interred in neighbouring graves. 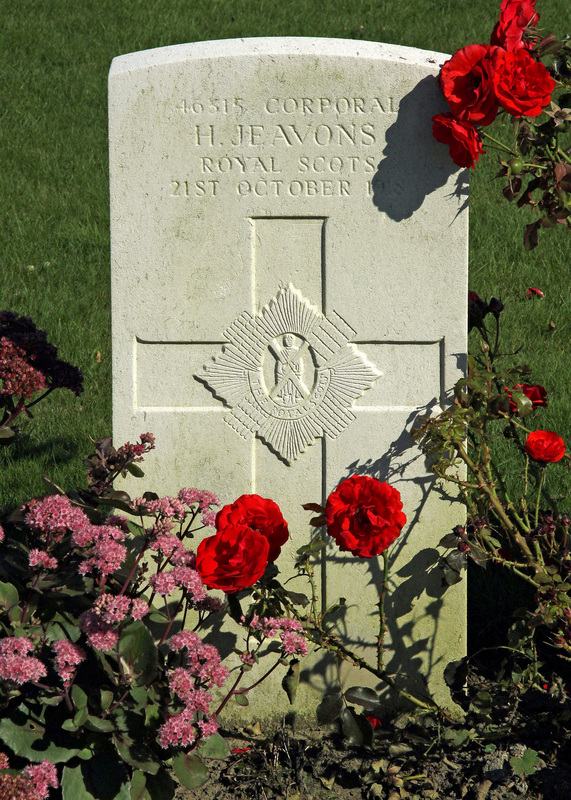 The Division was withdrawn for rest on 26th-27th October 1918 and was still in billets at the Armistice; Harold Jeavons was one of the final soldiers of the 12th Royal Scots to be killed in action.